Why is so much art about the ‘refugee crisis’ so bad? Even at a celebrity art gala you can don an emergency blanket and feel good about yourself. Hard political questions, not required. Artist Ai Weiwei (centre-left) carrying a blanket symbolising refugee needs, in London 2015. PA Images/Frantzesco Kangaris. All rights reserved.The famous artist lies face-down on a Lesvos beach. The beach, the pose, seem familiar from the initially shocking, now iconic image of the drowned boy Alan Kurdi. But the dead Syrian toddler is nowhere to be seen. Instead – look! – it’s Ai Weiwei! Ai’s undoubtedly sincere gesture has been much mocked: Jonathan Jones called it a "crass, unthinking selfie". Once again, a celebrity sees a humanitarian crisis and realises that what the world needs is an image of himself. But what does this unfortunate collision of "an incredibly important artist" and the "hopelessness of the people" tell us about the difficulties of looking at refugees? If Ai is less than successful in representing "the whole immigration crisis", where does his failure leave the possibility of such a project? "There is no refugee crisis," Ai has said, "but only a human crisis". His artistic project is "to relate to humanity’s struggles", his Lesvos image a straightforward attempt to embody this suffering humanity. Ai has faith in the gesture of empathy as antidote to the inhumanity of politics. Unfortunately, the gesture of the empathiser has a tendency to occlude the object of empathy. The performance of empathy has become something of a cultural trope, from students sleeping out in support of the homeless to campaigners undertaking the challenge of living on the financial resources of destitute asylum-seekers. In each case, the position in all this of the hypothetical recipient of empathy is rather unclear. By displacing the victim from the visual field, Ai’s image has the virtue of literalising this problematic. The other thing that is displaced in the performance of empathy is politics. Ai’s focus on that great abstraction "humanity" lifts his gaze far above the humdrum political decision-making that actually cost Alan Kurdi his life. The crisis becomes the existential one of death, the great sea that awaits us all. But this is not at all the nature of the 'refugee crisis'. As has been observed, it is in fact a crisis of values and politics. Crudely, refugees only get to be a 'crisis' when they start coming 'here', to our world of privilege. The moment of crisis is a political decision, in this case to refuse to organise Europe’s ample resources to respond in a coherent and responsible way to the perfectly manageable flows of refugees and migrants. Empathy with humanity can be a way to avoid this attribution of political responsibility – even European leaders have wept crocodile tears over the dead, whilst seeking ways to save them by preventing them from setting out for Europe in the first place. Ai purveys an empathy that is accessible and democratic, neutralising political crisis into a (passing) crisis of feeling: even at a celebrity art gala you can don an emergency blanket and feel good about yourself. Hard political questions, of your country’s leaders or yourself, not required. Part of the difficulty of representing the 'refugee crisis' may lie in the very ubiquity of its representations. This may be the most photographed humanitarian crisis in history: the tragedies playing out on Lesvos beaches can be recorded by anyone with a smartphone and a cheap flight ticket. The very endlessness of images of disaster can numb. The only limitations on the flood of images are the media taboos on what degree of horror can be shown. The power of the Alan Kurdi images derive partly from the decision of Western newspaper editors to allow through these particular images of a dead child. Ai seems to be grappling with these difficulties of representation. He sees the inadequacy of the passive contemplation of yet more images of refugees. Instead, he goes there, he sets up camp in Lesvos, he enacts Alan Kurdi’s death. His willingness to engage is praiseworthy. But the result is bad art, in that we just end up with another glossy image to contemplate, the helplessness of the refugee victim doubled in the helplessness of the artist. In its very failures, Ai’s work points obliquely to the key political content of the 'crisis': the collapsing of distinctions between the 'here' of comfortable Western lives and the 'there' of humanitarian catastrophe and war. This disruption of our beaches and Eurostar journeys is immensely unsettling, and goes to the heart of the political construction of Europe itself. Apparently hardened war correspondents found working on the Greek islands unexpectedly traumatic, as being 'here' in Europe prevented them from putting in place the usual psychological defence mechanisms. This struggle over the shifting space of globalisation is key to the politics of the 'refugee crisis', just as it is to Trump’s projected wall. The European 'here' must be protected from the alien 'there', if necessary by militarising the Aegean and turning Greece into a vast borderland of camps. Images cannot capture this respatialisation of our political geography, as they are always already locationless and floating. They can register disjunctures (tourists sunning themselves as boats arrive), but they cannot move past this shock reaction to articulate where we are when 'here' and 'there' collide. One of the places we end up is nowhere – the non-places of the refugee camps documented by Richard Mosse in the sublime black-and-white of his heat-seeking military cameras. Mosse’s extraordinarily beautiful panoramic hells have undeniable power, and relish the uncomfortable irony of redeploying cutting edge military gadgetry to aesthetic ends. But they arguably do not go beyond registering this nowhere as military-industrial sublime to the more difficult questions of our relationship to these non-places. If our predicament is to be lost in these disjunctures and nowheres, contemporary art is in general poorly equipped for any project of spatial reorientation. The art world is itself a globalised nowhere, with the same elite artists exhibiting in similar galleries around the world. Indeed, the Ai beach photo was produced for a feature in an Indian art magazine. By contrast, the most powerful and exciting document of the 'crisis' that I have seen is not the work of an artist. 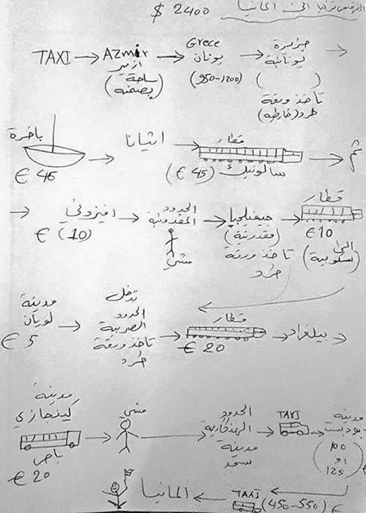 It is a simple sketch map, posted on Facebook by an anonymous Iraqi and disseminated by journalist Ghaith Abdul-Ahad. In a few sweeping arrows, prices in various currencies and cartoonish boats and buses, it describes how you get from the Turkish coast to destination Germany (signified by flag-waving stick man). Its exuberance conveys that extraordinary period in 2015 when migrants themselves were actively refiguring Europe’s political geography, on foot, communally, in great numbers. Critically, it sees ‘here’ from ‘there’, it is a tool for action rather than an object of contemplation – and the migrant is doing the seeing. Drawing by Iraqi migrant. Disseminated by Ghaith Abdul-Ahad.I don’t mean to claim that only refugees themselves can represent this crisis, and that artists can have no role (which would be particularly unfair on Ai, given his own experience of political persecution). But this map may be a clue to the kinds of approaches that could be productive in grappling with our current disorientations. If the old hierarchical spatial configurations are no longer sustainable, or are only sustainable with the violence of walls and razor wire, then there is a role for art to set out alternative ways of mapping our predicament. Last week, I was sitting in a conference room at a workshop for experienced NGO leaders by the Freed Voices group of experts-by-experience of immigration detention. The format should have been familiar: stories of personal experiences of detention that will inform our work as we return to ‘our’ space of advocacy. Instead, within seconds I have my eyes shut and am instructed to think of an experience of trusting someone. Then, we are writing our questions on the walls – and the migrants have barely spoken yet, beyond a sparse few instructions. Later, they are staging media interviews between themselves, no (white European) interviewer in sight. The Freed Voices (who are campaigners rather than artists) specialise in these disruptive spatial interventions. They have previously produced maps of the UK’s detention centres, non-places devoid of maps for security reasons, according to the experiences and emotional associations of the different rooms and wings. The Freed Voices are resolutely here, not images in someone’s art project but living amongst us with (mostly) irregular immigration status, liable to be redetained at any time. Telling us to shut our eyes and think of our childhoods. This article is part of the series Forced Migration and the Humanities. This dialogue is an editorial partnership with openDemocracy 50.50 led by Mariangela Palladino (Keele University) and Agnes Woolley (Royal Holloway University of London).